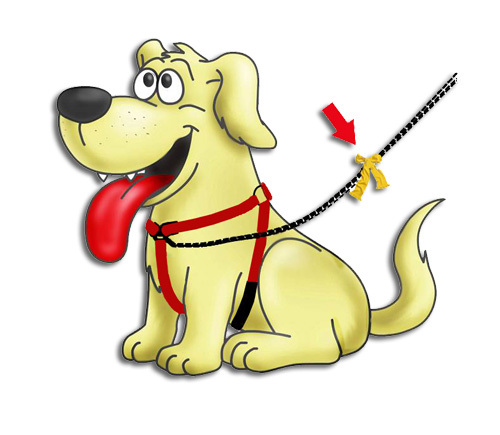 If you see a dog with a yellow ribbon on the leash this is a dog who needs some space. Please do not approach this dog or its people with your dog. They are indicating that their dog cannot be near other dogs. How close is too close? Only the dog or his people know, so maintain distance or give them time to move out of your way. Maybe he has health issues or is in training. She may be a rescue dog being rehabilitated. The world can be a very scary place for these dogs. In short, a yellow marker on a dog means it needs a little space. dogs appreciate your help and respect. Yellow Dog is a campaign that appears in several countries. A campaign for the dogs who need more space. By a yellow marker on the leash, I can show that my dog needs more space. Maybe temporarily, or for a longer period. A dog in pain may be scared to get hurt. Or a dog that is adopted may feel that the environment is daunting and requires careful training for a long period. Do You have questions about our campaign? Do You want to contribute? Or other things about the campaign in Your mind? Do you know about FB pages? Please tell us or ask us för help if you wan’t to start one! We appreciate if you would help us to translate. You must have good knowledge of the language as it may be difficult for us to check if it is correct. Please contact us before you start, maybe a translation in Your suggested language has already started.